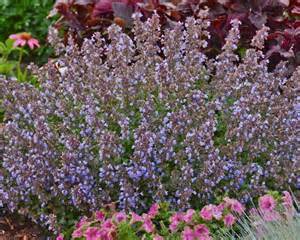 urrsian Blue Catmint is a colorful perennial that will bloom from spring through the summer. It will grow from 12" to 18" tall and from 18" to 30" wide. It has gray- green leaves which are aromatic. The blossoms are a purplish blue and will benefit from deadheading. Plant in full sun to part shade in well drained soil. Purrsian Blue Catmint will attract hummingbirds and goes well in a container. It is deer resistant and will become drought tolerant once it is established. Purrsian Blue Catmint will also make a great groundcover.